Ken: Jim, I first want to apologize, as I know that in order to fulfill your duties to Bad Movie Diaries this month, you too had to go in for the free trial month of Pure Flix’s streaming service. I’m sure we’ll have ample reason to commiserate on the weird FWD: FWD: FWDs we’ll be getting via email from now until well, well after it disbands. Jim: For me, it was worth it for the laughs I harvested from perusing the library of this “wholesome” Christian streaming service. More on that in a minute. But first, I’ve got to ask you how the hell you found Best Friend from Heaven. Usually, I’m the one explaining how I found some kind of batshit, obscure cinema in this column. But this movie is way, way off the beaten path. It’s not even available to rent via Amazon, YouTube or any of the other usual suspects. The only place to see this film, as far as I can tell, is via Pure Flix. Ken: I can’t rightly remember which entertainment news outlet highlighted this one for me, but it sounded so prima facie stupid that I one day, months later, thought to myself, “Did I really read a story about a ghost dog who becomes a wedding planner?” and then googled it. Lo, I discovered not only that I had not been tripping on something but that Best Friend from Heaven had actually been released just a couple months ago. I wasn’t about to let this one go unremarked upon, because the world forgot it instantly. Jim: If we forgot it, it would simply be because this movie is such a boilerplate Christian family film. It’s got a wedding; it’s got a ton of white people; it’s got completely toothless romance; it’s got very low stakes; most importantly it’s got a dog. I would say roughly half the films available on Pure Flix are all dog movies. It’s the simplest way to make a low-stakes Christian movie. This one happens to be directed by a man named “Justin G. Dyck,” which sounds like a pseudonym to protect himself from the notoriety of having directed Best Friend from Heaven if I’ve ever heard one, but he’s actually quite prolific. This guy directed no fewer than seven movies in 2018, and 11 episodes of a Netflix series titled—I kid you not—Ponysitter’s Club. Ken: I wonder if Steven Seagal starred in any of them? Jim: Not unless Seagal made an uncredited appearance in Justin G. Dyck’s Christmas with a View or A Christmas Village. Ken:A bit of background for those of our readers who may not be familiar with Pure Flix, about whose God’s Not Dead series I have somewhat unfavorably written: This production company has risen, as I understand it, off the back of the aughts boom of Christian-targeted films that have become more prevalent since The Passion of the Christ punched above its weight class a good while ago. It is chiefly interested in catering to the tastes of the sort of audience that doesn’t like anything stressful to appear on screen. To say these movies don’t challenge their viewers is to severely understate it. To say they’re almost uniformly awful would be charitable. And as I pointed out in my article on the God’s Not Dead movies, this looks an awful lot like a grift. The more successful of these movies pull in way, way more than they cost to make, and you don’t see a dime of it in the next installment. Jim: To that end, did you notice that in the settings of Pure Flix, it automatically has “Clearplay Filtering” enabled, which says it will “automatically mute language that may not be suitable for all audiences”? What language do you think they’re talking about, here, Ken? Arabic? ESPERANTO?!? Ken: I have it on the authority of my girlfriend’s kids that their evangelical grandmother won’t let “gosh darn it” slide in her house, so who the hell knows, Jim. It probably bleeps out “Hey, Sally, want to hold hands even though we haven’t exchanged promise rings?” We are most definitely dealing with a service terrified of angering the touchiest of fan bases. As a result, Best Friend from Heaven is the most saccharine bromide you’re ever likely to swallow on any screen, big or small. Incidentally, I never checked to see if this even was released in theaters. Jim: I can’t imagine that it possibly was, unless it was the smallest and nichiest of engagements. Which honestly isn’t to say that the quality is objectively terrible on all fronts. Technically, this is as competently made as most TV movies or cheap Netflix fare. Story and character-wise, it’s a [BLEEP] mess. Ken: Oh, shirt! I think we left the language filter on!! Jim: Set the scene for us, if you will. Ken: We are in Smalltown USA, a place so wholesome that everybody knows everybody’s dog and even the homeless masses who need a hot meal at the church soup kitchen are dressed like they’re debating whether to take on a jet ski payment or a home improvement loan for that book nook they’ve always wanted to add to the first floor. One or two are Asian. A pastor and a church full of people impatiently await a chronically late young bride. She is still at home, and leaves the back gate of her yard’s fence open, allowing a squirrel to tempt her dog, Gabriel (whose name is misspelled “Gaberiel” in the opening credits) to go bounding out into traffic, where the feckless young flower delivery boy Jerry runs him over. You mentioned you got a kick out of the groom running out of the church to go help his distraught bride, right down the center aisle of the place, like there was no back exit. Jim: It was the hardest I laughed during the entire film. I love the idea of a groom sprinting down the aisle with a look of terror on his face, without bothering to offer any word of explanation to all his friends and family in attendance. Great stuff. Also, I didn’t notice the misspelling, but I’ll make sure it lives on forever in screenshot form. It’s perfectly emblematic of how little anyone cared about this movie. Ken: Well, Gaberiel’s story isn’t over! He ascends beyond the firmament and appears at the gilded doggy door of St. Peter, discovering that he can now talk in the disinterested, phoned-in voice of Kris. Forking. Kristofferson. This is achieved, Jim, with the most hilarious lip-flap-CG ever. You do say this looks fairly competently shot and I can’t disagree, but the talking dog lips, always transitioning back to the poor dumb creature panting before and after each exchange, just pushed me right over the edge. Anyway, a squirrel distracts the heavenly canine gate enforcer and Gabe Kristofferson, determined to stand by his master on her wedding day, just blithely steps back through the veil to return to Earth. There must be legions of undead beagles and huskies wandering among us even now, if that’s all it takes. Back on Earth, he finds that a whole month has somehow passed. I don’t mean to minimize the loss of a pet, but Gabe’s untimely passing has hit the small town like a presidential assassination. Tara, the bride, stops going to church (!!!) and is plunged into darkest mourning. Jerry the flower boy’s name ain’t worth spit—he gets mean-mugged by everybody in town just walking down the street. Gabe, of course, is now ethereal, though no FX are spent making him seem that way. It turns out, in a supremely forked up twist, that his murderer, Jerry, is the only one who can see him or hear his Kris Kristofferson voice. This is something a serial killer would fervently believe. And so, Gabe haunts Jerry day and night until he agrees to help stage a surprise wedding for Tara and her boyfriend, who totally doesn’t explicitly live with her. And that, sir, is the full premise of Best Friend from Heaven. Jim: The afterlife is like in Beetlejuice, Ken. Time passes differently there. Also, you missed a chance to call the heavenly canine attendant “St. Pupper,” and I’m disappointed in you. Thank you for the tidy summary, though. That is indeed all there is to Best Friend from Heaven. The “to heaven and back” stuff takes about 20 minutes, and then the rest of the film is the ghost dog chiding Jerry the flower boy into rallying the townspeople behind these secret wedding plans. He manages to convince them all by promising to essentially become an indentured servant to everyone in town, working small jobs here and there in order to make the wedding happen. Ken: These sequences are so lame and dragged out that they resist summary, by the way. Every shot is too long, and no dialogue sounds natural. 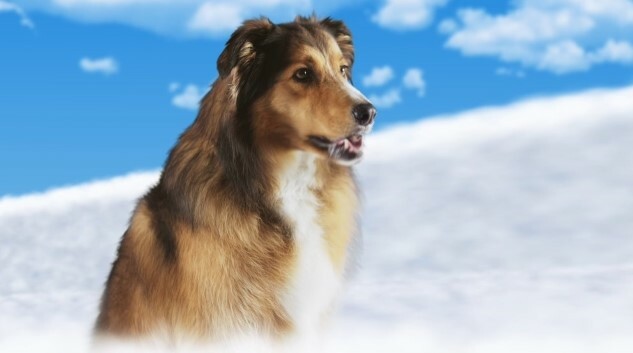 The only actor who I suspect might not have been cast straight from the church phone tree is the one who plays St. Pupper, as you call him: This gatekeeping good boi suddenly realizes Gabe has broken out and descends to Earth to claim his bounty before The Big Man finds out. On Earth he is in human form, and the actor seems like he knows how dumb an offering he’s in. This impacts the plot barely at all: He doesn’t find Gabe until after the wedding is basically pulled off. Jim: I was going to note at some point that the guy playing St. Pupper—I believe IMDB says his name is Keith Cooper, but it’s hard to tell because THE MOVIE NEVER GIVES THE CHARACTER A NAME—was clearly the most natural and accomplished actor in the film. He’s the only one who could sell any of the comedy material, that’s for sure. Ken: This experience is bound to make it into his tight five. Jim: Kristofferson’s dialogue, in comparison, is just as disaffected and bored as you’d expect it to be. The first time he realizes “I can talk” out loud, there’s clearly no exclamation point present in the sentence. It’s like he’s reading everything off a script for the first time as he says it. With that said, he’s still about ten times better than Eric Roberts in A Talking Cat?! ?, which remains the gold standard for incredibly bad talking animal movies. Ken: Still, it is so distracting how bad that aspect is, because he’s the one name in the whole thing you recognize! This guy was dusting vampires shoulder-to-shoulder with Blade in the good movies! Now he’s slumming in direct-to-video Christian dog movies. Which reminds me: Jim, you have more of a Christian upbringing than me. Does anything here make any impression on you, from that perspective? Ken: Yes, I definitely found the low-key faith message pretty easy to ignore, though I have to give them props, in one scene, for Jerry shushing Kris Krisdoggerson for talking during a sermon. “Shut up, doge, WHY ARE YOU TRYING TO BE AN INCITING INCIDENT WHILE I’M LISTENING TO THIS SERMON THAT DOES NOTHING TO ADVANCE THE PLOT? ?” I guess that’s the “refusal of the call” in Jerry’s hero’s journey, if we’re going to over-analyze. Anyway, my girlfriend, who knows her tedious Christian films, did mention that this would actually be an affront to hardline evangelicalism because 1) contrary to Don Bluth, no dogs go to heaven and 2) they also do not believe in ghosts. So that’s a double whammy. Jim: I’m afraid those aspects are outside my areas of expertise. I do want to discuss the thing I found most interesting about this movie: The fact that Jerry the flower boy is the main character, and the couple getting married are barely in the film at all. I was never even sure of the male partner’s name until the very end. They aren’t characters in this movie, Ken! Ken: That is absolutely a glaring flaw in the script, yes. Jim: Both St. Pupper and “Willow,” the eccentric, red-haired artist woman are both far more developed in this story than the couple getting married—you know, the people you would assume would probably be major characters. We learn more about the preacher father and the bride’s sister than we learn about the bride or the groom. It’s like nobody realized that it would be hard to make the audience care about whether these people get married without them BEING IN SCENES and HAVING DIALOGUE and us learning SOMETHING about them. The bride and groom, in whom the film seems to have zero interest. Ken: We could unpack a lot of things here about the whole get-married-for-getting-married’s-sake aspect that underlies this movie, but I’ll just say: If I found out my whole town was planning a wedding for me, even if a tragedy had cancelled my already totally voluntary nuptials, I’d wonder if I’d stumbled into a Twilight Zone episode. Jim: This town works in unity, whether it’s loving or hating things. I found it hilarious that Jerry was shunned by everyone in town after the accident. At first I thought everyone just disliked him for some reason (because he’s a dweeb), but then the restaurant owner literally tells him, “Well, we all really liked that dog.” It’s like the town meets once a week to decide their opinions en masse. After all, it’s not like Gabriel was a particularly interesting or special dog in life. He wasn’t doing tricks, or feeding the hungry. Ken: Yeah man, it’s like a Stepford Wives vibe or whatever, but the thing is, it’s supposed to be innocent and wholesome!!!! Jim: Unrelated: I don’t mean to shame the guy, but did you notice that Jerry seemed to randomly have a lazy eye during about 25 percent of his scenes? He looks perfectly normal most of the time, but other times he’s like this. It makes his character seem a bit more unhinged than they were probably going for. Ken: I did notice that, though I don’t want to give the guy a hard time about it. I absolutely will give him a hard time about acting as emotively as an unstained block of cedar from the only shop class in Wisconsin that survived the cutbacks necessary to fund that Foxconn factory. Jim: He has a knack for making faces that are distinctly wrong for the tone or emotion he’s supposed to be conveying. He just sort of holds this anxious resting face, then breaks into a big grin at the end of every line, regardless of whatever he just said. It makes me wonder: Did the actors playing the couple getting married even realize that they were in a movie about Jerry’s redemption? I kept getting the feeling that these two signed onto this thinking they were the stars. Ken: I have no idea, but if they were sold on this for the promise of stardom, somebody bore them false witness indeed. Anyway, after much messing around, including one sequence I am unashamed to say I straight up frame-skipped where Jerry earns some of his keep as a clown at a kid’s birthday party, the wedding is finally on. Human St. Pupper is about to collar Gabe, but is convinced to let the dog attend the wedding. By the way, we get no tearful reunion between doge and his girl Friday at the end, à la Hocus Pocus, which is just leaving heartstrings on the table if you ask me. Jim: Yeah, that is kind of weird. The now-married couple never find out about/interact with the dog at all, even at the end. It’s just one more odd choice to minimize those characters entirely. I’ve never seen a movie about a wedding that is less concerned with the bride and groom. Gabriel, regardless, doesn’t get another chance at life or anything—he accepts it’s time for him to go, and the movie makes sure you go home happy by giving the newlyweds a new puppy in his place. Bada bing, bada boom. Turns out we had a spare dog in the trunk the whole time! That’s really all that’s going on here, Jim. I usually ask what we’ve learned, but I know the answer is nothing. Jim: I learned less than nothing, and I forgot some things I used to know. Instead, let me simply raise a couple random, weird points we didn’t get to. Ken: Lay them on me. Jim: First, I want to talk about a very strange, seemingly morbid joke they do with the redheaded, kooky dressmaker/artist woman, Willow. You know who I’m talking about? She’s the one doing all the most painful comic relief. Ken: Is this where it’s implied she’s one overly-sugared mug of coffee away from a diabetic coma? Jim: Yes. Yes it is. They’re literally joking about her diabetic nerve pain and the fact that it’s going to kill her. Right? There’s no other way this can be rationalized, right? Ken: Yeah, that is precisely how I read it. Definitely a sensitive joke to be making in a movie aimed right at Middle America. Jim: It’s freaking bizarre. Why would you stick that in this movie? WHY HAVE ONE MORBID DIABETES JOKE LIKE THIS IN AN OTHERWISE SACCHARINE FAMILY FILM. Ken: What else jumped out at you? Jim: Nothing in particular in Best Friend from Heaven. I think we can put that one to bed. I’d just like to share a few of my other favorite finds via Pure Flix. Jim: First up, we have my favorite new genre: Violent Christian action movies. Ken: No way! You mean I missed The Mark 1???? Was there a Mark 1? Jim: Yep! In The Mark, “a surgically implanted chip puts a ‘marked’ man in a dangerous situation,” according to Pure Flix. Ken: I might need to watch this before I cancel my subscription, not going to lie. Jim: How could you not be tempted? Next up: A no-Christ-at-all movie about an old woman who takes a cab to Canada. Jim: Ask me how I know what this movie is about. Ken: I couldn’t begin to guess, sir. Is he kidnapping her, taking her on a “Million-peso ride” to the ATM, as they call it in Bogotá? Jim: Nope! She’s an old lady without a friend, so she has to take a cab thousands of miles to Canada because nobody else will drive her. And yes, that’s Maureen O’Hara from The Quiet Man. This was a TV movie from near the end of her career. It’s also a great example of the random stuff they’ve used to fill up the Pure Flix library that nobody else would ever want. Ken: That’s a far cry from getting caught with John Wayne out on the rainy glens … and then getting straight up battered by him as the town cheers him on. It’s good to know there’s a streaming service out there providing such essential content, Jim. Do you think we’ll pull another gem from here for next month’s Bad Movie Diaries? Jim: Well, if we wanted to keep up the dog theme, I do have the perfect dog movie sequel that nobody ever asked for. Ken: Shut. The Fork. Up. Jim Vorel is a Paste staff writer, and you can follow him on Twitter. Kenneth Lowe is a contributing writer for Paste, and you can read more of his writing at his blog.